成為一個在基督裡合一, 見證神恩典的教會. 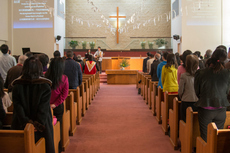 (以弗所書 4: 2-3) Be a church that testifies of God's grace through unity in the body. 請輸入您的電郵及本網站專用密碼以登入報名。 Enter your email and password received from this site to log in. 首次使用網上報名者,請先點擊此連結以取得密碼。 First time user, please click this link to get your password. 忘記密碼請點擊此 Click here if you have forgotten your password. Contact Us: retreat@cccnj.us Click here if you have forgotten your password.